[April 12, 2007] MOUNT PULASKI -- Robert W. “Bill” Howe, 77, of Mount Pulaski died Sunday, April 8, 2007, at 2:13 a.m. at Decatur Memorial Hospital, Decatur. 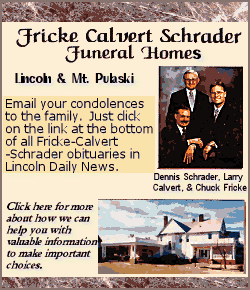 Visitation was 4-7 p.m. Wednesday at Fricke-Calvert-Schrader Funeral Home in Mount Pulaski. His funeral was at 10 a.m. Thursday at the funeral home, with the Rev. Russell Pattie officiating. Burial, with military rites, was in Lake Bank Cemetery, rural Mount Pulaski. Mr. Howe was a retired farmer and excavator. He served from 1950 to 1954 in the U.S. Air Force, where he was a staff sergeant. 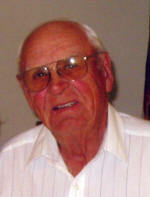 He was born July 28, 1929, in Mount Pulaski to Robert Lee and A. Ruth Wubben Howe. He married Waltraud Martha Juette in Simmershausen, Germany, on Sept. 4, 1954. He is survived by his wife, "Wally," of Mount Pulaski; one son, Greg (and Charissa) Howe of Mount Pulaski; one daughter, Julie (and Carl) Oglesby of Lake Fork; two brothers, Harold Dean (and Camille) Howe of Salt Lake City, Utah, and Jerry (and Karmen) Howe of Versailles, Mo. ; and six grandchildren, Katherine "Katie," Kristen, Kimberly and Kelsey Oglesby of Lake Fork and Breanna and Roman Howe of Mount Pulaski. He was a member of Mount Pulaski Zion Lutheran Church; American Legion Post 447, where he was a past commander and the finance officer for many years; Veterans of Foreign Wars Post 777; and a past member of the Lions Club. He served on the Logan County Board and was a former Laenna Township supervisor. Memorials may be made to American Legion Post 447. Click here to send a note of condolence to the Howe family.